JMA has welcomed students from SUNY Fredonia, which happens to be just down the street, and also from other universities in the surrounding areas such as St. Bonaventure University and Medaille College. Dr. Susan McNamara, Ph.D., Assistant Professor of Management and Internship Coordinator for the Business Department at Fredonia, takes every opportunity to encourage students to incorporate internships into their curriculum. JMA has hired many past interns over the years; while others have gone on to do other great things with their careers. Dr. Linda Hall, CPA, MBA, CMA, Ph.D., a professor in the School of Business at SUNY Fredonia, completed an internship with JMA during her undergraduate career at Fredonia in 1984 – back when the firm was named Coppings, Johnson, Mackowiak & Myott (CJMM) Certified Public Accountants. Dr. Hall certainly utilized her experience at JMA to grow her career. After graduating from SUNY Fredonia, she worked at a public accounting firm in Buffalo, passed the CPA exam while completing her master’s degree, worked in a corporate accounting firm, passed her CMA exam and then began teaching at a private college in Buffalo while completing her Ph.D. Remember how CPA’s have a special type of brain power? Dr. Hall has provided the proof of that power through hard work and dedication to a successful career in public accountancy. These experiences also led her to the current position she holds at SUNY Fredonia, and where she also worked on a post-doctoral program. Dr. Hall, now teaching accounting students in the School of Business, is also encouraging students to take on internships. A current accounting student at Fredonia, Alicia Mikowicz, is in the midst of her second tax season with JMA, while our other intern, Cierra Burtner who attends Medaille College, travels down to JMA for her first season. Both are learning and completing tax returns under the supervision of one of JMA’s managers, Marcie Lukach, CPA, who also happens to be a past student of Dr. Hall’s at Fredonia and a past intern at JMA. This past January 2014, JMA hired former intern, Richard Burlett III, as a staff accountant upon his graduation from Fredonia’s accounting program in December. 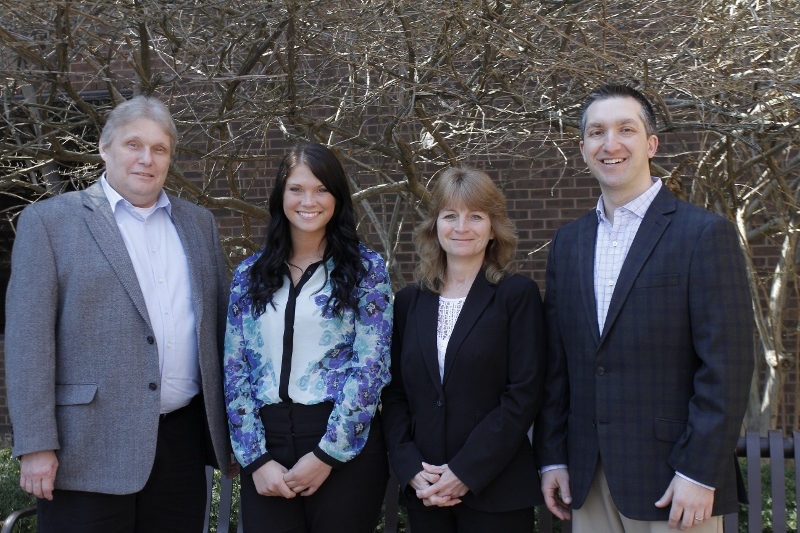 Alicia and Richard were both instructed by Dr. Hall at Fredonia, and have both made significant strides with their knowledge and experience in the industry and at the firm. JMA continues to encourage the development and self-improvement of every intern welcomed through its doors. In fact, nearly 80 percent of JMA’s accounting staff, including firm partner Kevin Wystup, CPA, are graduates of SUNY Fredonia and began their careers as interns. Several other interns have chosen to take career paths that have led them into financial institutions, insurance agencies and like Dr. Hall, into higher education. Richard Johnson, CPA, JMA’s recently retired partner and current chair of the College Foundation board at SUNY Fredonia, has always been a mentor for interns and staff, alike. At the conclusion of every weekly staff meeting, glancing around the room at his team of accountants, interns and staff, he would encourage them to work together as a team and to never hesitate to knock on a partner’s office door for a helping hand. Taking advantage of opportunities and having support and guidance along the way are the launching forces that get students out of the starting gates and into a career for which they have been prepared. When it comes to internships, Johnson, Mackowiak & Associates, LLP believes that they provide the solid foundation for success in any career.